The Megafon Tajikistan operator started its activities in 2001. The joint Russian-Tajik company, whose shareholders are well-known companies of OJSC Tajiktelecom and OJSC MegaFon, which provide excellent coverage and unlimited prepaid packages for users. 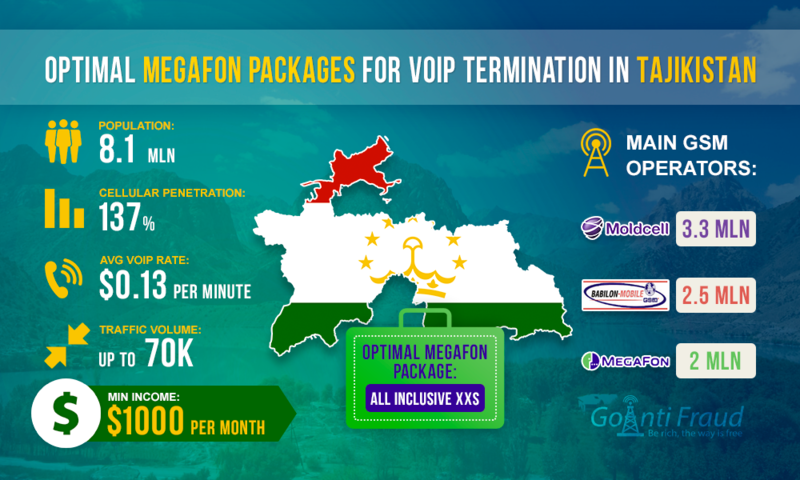 "Megafon Tajikistan" offers 10 calling plans to the subscribers. 9 of theme are "All Inclusive" and one of them "Real Unlimited." After analyzing their conditions and prices, we came to the conclusion that four of these prepaid packages are not suitable for termination as they provide an insufficient number of minutes - from 100 to 500 and certain limits regarding subscription fee and the time. Of the remaining six packages, the most favorable for the termination is "All inclusive: XXS", "Real Unlimited", and "All Inclusive: XS +”. Cost per minute of voice traffic Tajikistan via "All inclusive: XXS" is about $0.00072, "Real Unlimited"- $ 0.0008, and "All Inclusive: XS +”- $0.00093. The only condition to connect the tariff plans "All inclusive: XXS” and “All inclusive: XS +” is that you have to make an advance payment every 10 days, as well as you need to make the monthly fee of $ 0.64 for "All inclusive: XXS”, and $ 0.83 for “All inclusive: XS +”. Want to start the GSM termination business in Tajikistan? We offer you NewBusiness package for beginners, which will ensure you have a successful start. The solution from GoAntiFraud includes the necessary VoIP equipment, tools to protect against the SIM-block, as well as software to computerize the operation and remote control over GSM gateways. On the other hand, "Real Unlimited" provides a daily subscription fee of $0.64. This package is a success with terminators, since you do not lose money when a SIM-card gets blocked. So, the user can top up the account every day and use the money to make calls, without losing anything, even if he is suspected of termination. By the way, all three packages allow for unlimited communication. Such specificity of "Megaphone Tajikistan" tariff plans plays into the hands of seasoned terminators that can earn thousands of dollars, as it involves a long chat. This means that the flow of numerous calls via "All inclusive: XXS", "Real Unlimited" and "All Inclusive: XS +” will not cause much the operator’s suspicion of the SIM card fraud. At the same time, the voip international traffic of the operator costs $0.1153 per minute. Earnings per minute when using the above packages range from $0.11458 to $0.11437. Working 3-4 days for 5 hours, you will get as much as $1,029.33 a month. If you properly approach the issue of bypassing antifraud, you significantly increase revenue from VoIP termination. By connecting your Gateway VoIP GSM to GoAntiFraud, you will provide SIM-cards with a reliable masking of termination from operator tracking systems, since the system mimics all the behavior parameters of a living person in the network.